For what it's worth: I am Team Gisele. So, OK, I said before that I didn't care about the outcome of the Super Bowl, and it's true, I couldn't care less. And I don't really care about Tom Brady or Gisele either. So why do I feel the need to voice my support for her? It's not about her. It's not about Tom Brady. It's not even about some wide receivers whose feelings may have been hurt. 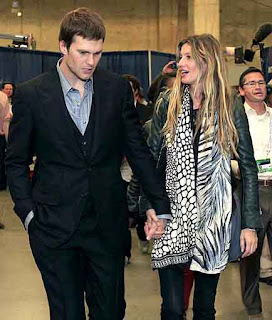 Gisele's comments indicate that she was emotionally involved in the game. She was emotionally involved in the game because she cares about her husband. She cares about her husband because- well, he's her husband. So she got caught up in the moment and said some things that hurt some people. She's only human, after all. She may be a supermodel, but her brain operates the same way. Who hasn't said something that they maybe didn't entirely mean, or came out the wrong way, because they were caught up in the heat of the moment? Haven't we all overreacted over something or someone we love? Most of us are just lucky that our moments of weakness aren't picked up by the media and shared with the world to dissect and criticize. She had his back. Isn't that what someone in a loving relationship is supposed to do? So take it easy on Gisele. She isn't trying to become an analyst or scoop reporters. She was just being a good wife- and that's refreshing.